One of the results of all the warm weather is the growing season running well ahead of schedule. My apple trees are beginning to bloom; these typically bloom a month from now. 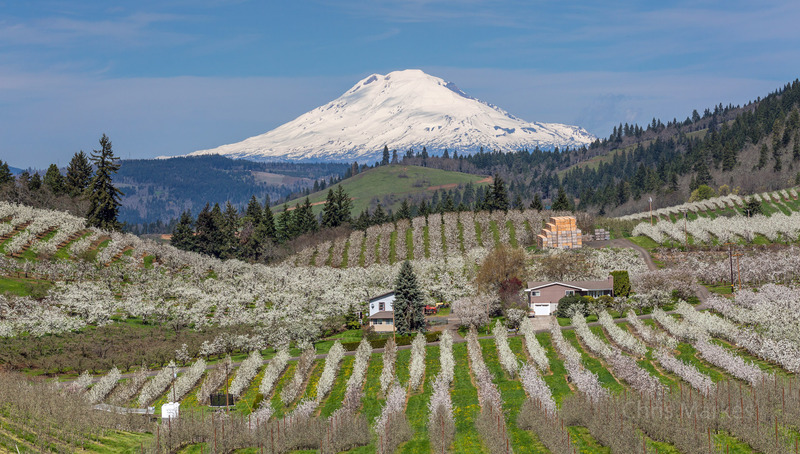 Chris Markes was out in the Hood River Valley today and says it is already at the peak…a good three weeks ahead of the main blossom festival time. So get out there within the next week! There have been several periods over the past year where the ridge has broken down and we return to a wet & cool weather pattern for a week or two, or three. This is happening again for at least the first couple weeks of April. Between now and April 15th there will likely be more snow above 5,000′ than we have seen since December! Lots of showers in the valleys too. Let’s just hope for no frost to ruin the blooming trees. You’ve got less than 24 hours to finish up any projects that need more than a few hours of dry weather. I see a long stretch of cool & wet weather beginning tomorrow night. 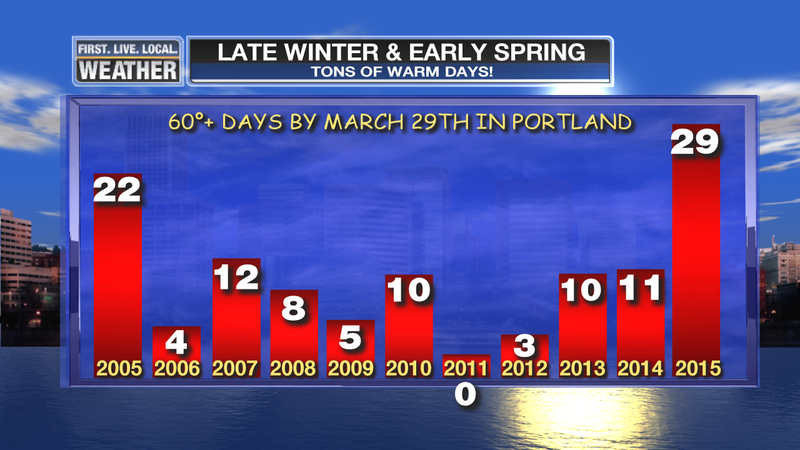 A quick look further back in time shows only in early spring 1992 did we have as many 60 degree days as we’ve seen this year! Our persistent ridge of high pressure that’s been sitting overhead or to the west of us for the last few months is going to take a break. 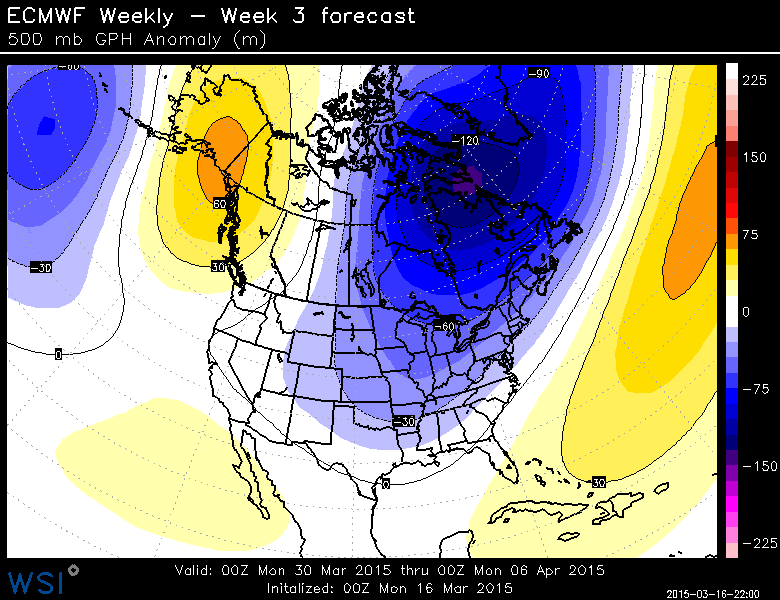 It appears the ridge is going to disappear for at least the first half of April. That doesn’t mean the rest of spring will be cold and wet, we don’t know that. It just means we’ll make up some snowpack in the Cascades. 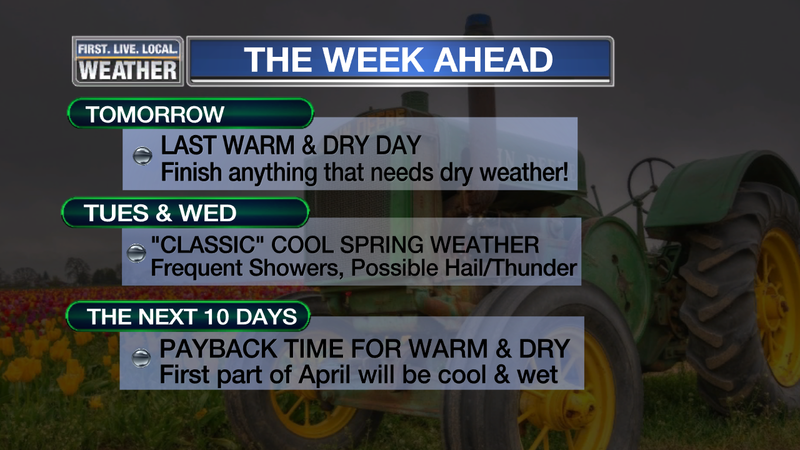 Too late to salvage the ski season of course now that Spring Break has finished and we move on to warm weather activities, but it will help the drought situation in some spots. How much rain ahead? 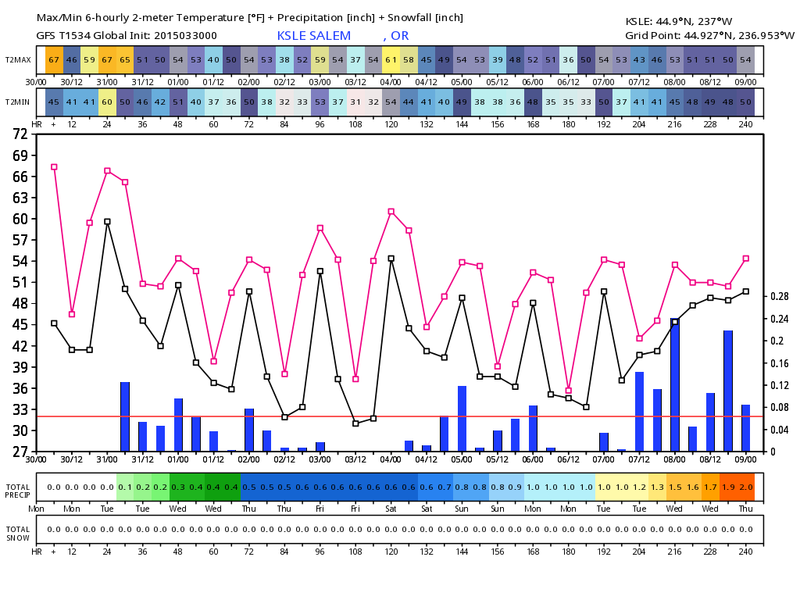 The GFS model shows around 2.00″ over the next 10 days. 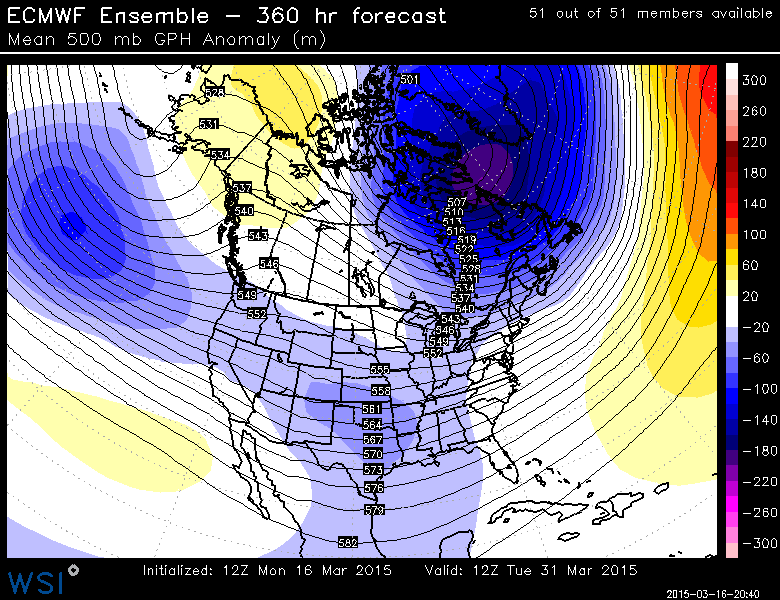 ECMWF model isn’t quite as wet, more like 1.00-1.50″. Both are wetter than normal for this time of year. I will be posting very little (or not at all) during the next 10 days. 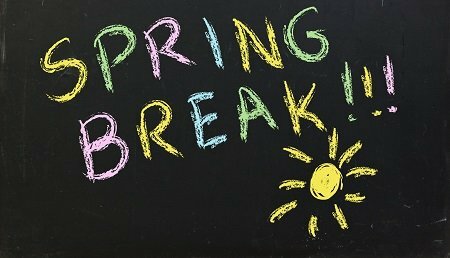 It’s Spring Break time in Oregon and I’m taking a vacation with the family through Saturday the 28th. I’ll be back at work on Sunday the 29th. When I visit schools and other organizations I often talk about how good our forecasting is getting nowadays compared to 25 years ago when I started. I have sometimes said “we’ll probably never be surprised by a major windstorm again“. We came close both in October and yesterday. Not a whole lot of warning. We sure didn’t see a major regionwide windstorm this year, like 1962, 1981, & 1995. 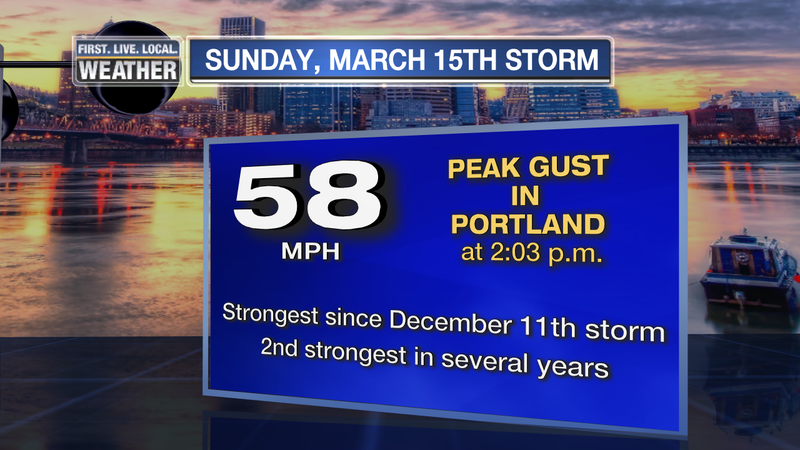 But we have seen 3 very impressive windstorms in the Portland metro area. Each of those put at least 70,000 PGE customers out of power at one time. It’s very interesting to note that all 3 low pressure center paths were similar; steeply south-southwest to north-northeast. That’s different from more of a westerly angle like WSW to ENE. That is excellent for getting a major windstorm here. 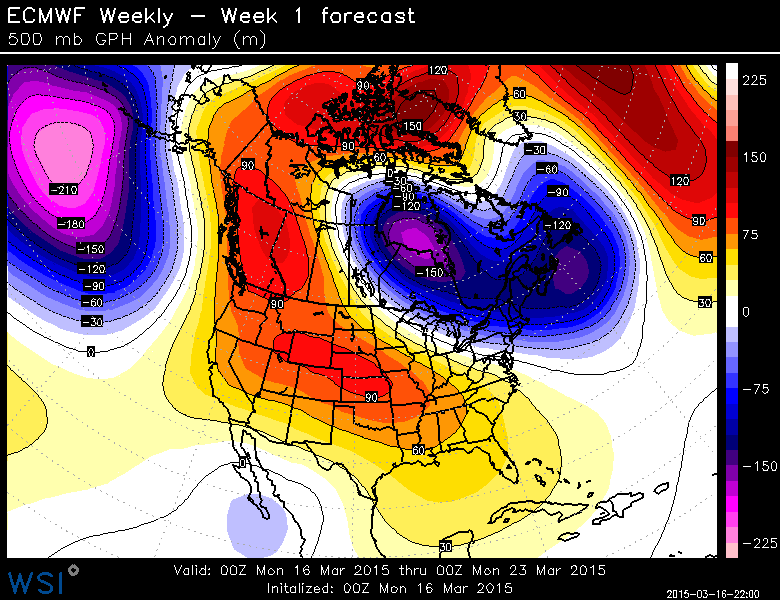 This one bottomed out only just below 1000 millibars! Hard to believe we saw widespread gusts 45-60mph with that isn’t it? The low pressure center made landfall right around Hoquiam. The December storm bottomed out around 973mb, and the October storm was around 980 mb. Models had trouble with all 3 storms this year, and two of those storms occurred with only about 24 hours of warning (this one and October). For Salem, Hillsboro, & Battle Ground this was the strongest storm of the season…stronger than December. The strong wind gusts were more evenly spread around the region. 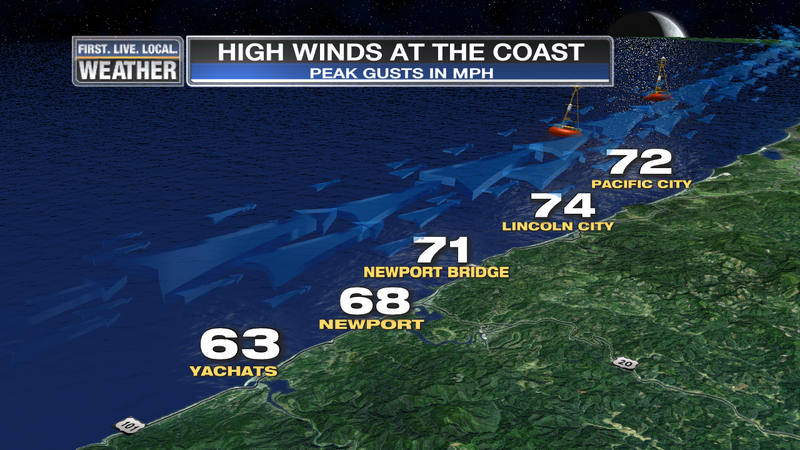 Look how the Oregon Coast saw strong wind this time as well. 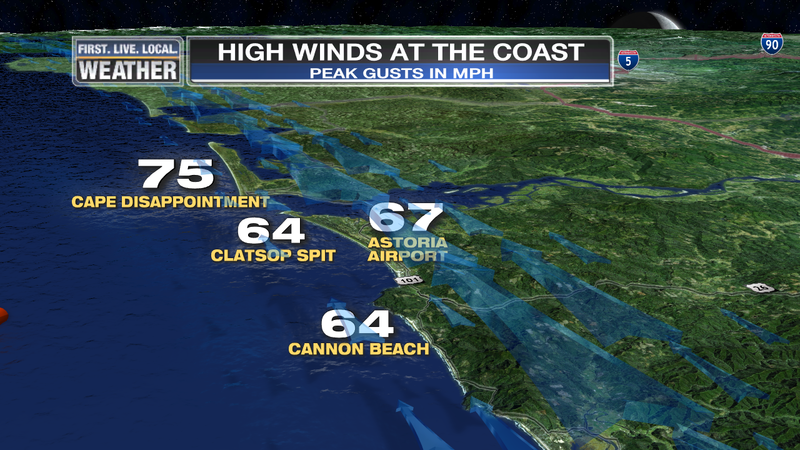 In December Portland saw higher gusts than many coastal locations, which was strange. The problem this time around with the forecast was that models were having real trouble deciding where a wave along our very wet frontal boundary would track. Look at the surface map for Sunday 5pm from the NAM-MM5 and WRF-GFS initialization. Looks like a low pressure center around 996-1000mb just moved inland and is centered near Olympia. This is what actually occurred. At 48 hours away neither is close to reality. NAM has a low along the frontal boundary in eastern Oregon and the WRF-GFS is spinning something around off the southern Oregon Coast. These are the last maps I saw Friday evening before the 10pm show. Now it’s very interesting and both models agree…some sort of gusty wind event is on tap for late Sunday evening. The low is supposed to still be off Newport at this time. Timing has speeded up again! NAM is very strong and just about right on for placement. The GFS ended up being too fast. They both show a perfect setup for strong wind. So I’d say models latched on around 24-36 hours out and once they did the surface low pressure intensity forecast was close to reality from that point onward. 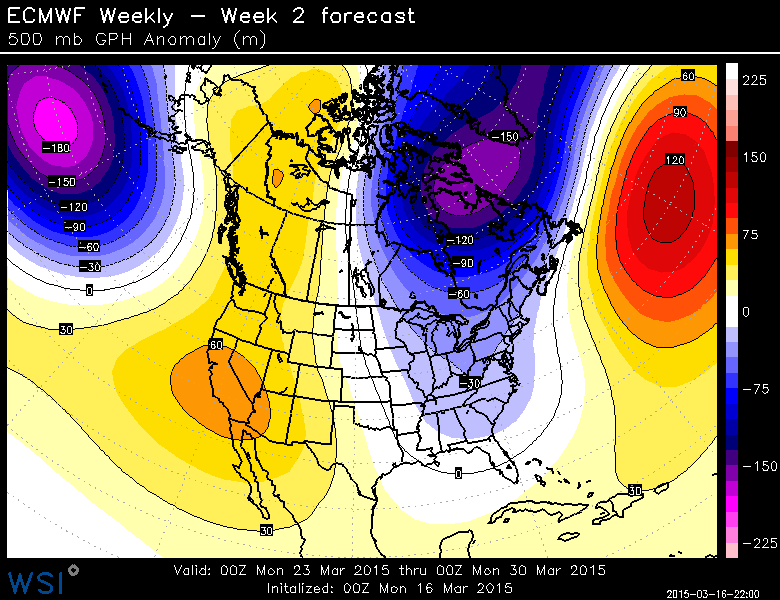 The larger scale models (GFS/ECMWF/NAM etc…) were similar to these. I’ll do a summary of the storm late this evening between shows, but for now I’ve got the 4 weekly maps from last night’s run of the ECMWF. Still ridgy along the West Coast or just offshore through the period. That sure doesn’t mean DRY through mid-April, but it means most likely we’ll AVERAGE warmer and drier than normal. Week 4, this goes through April 12th. 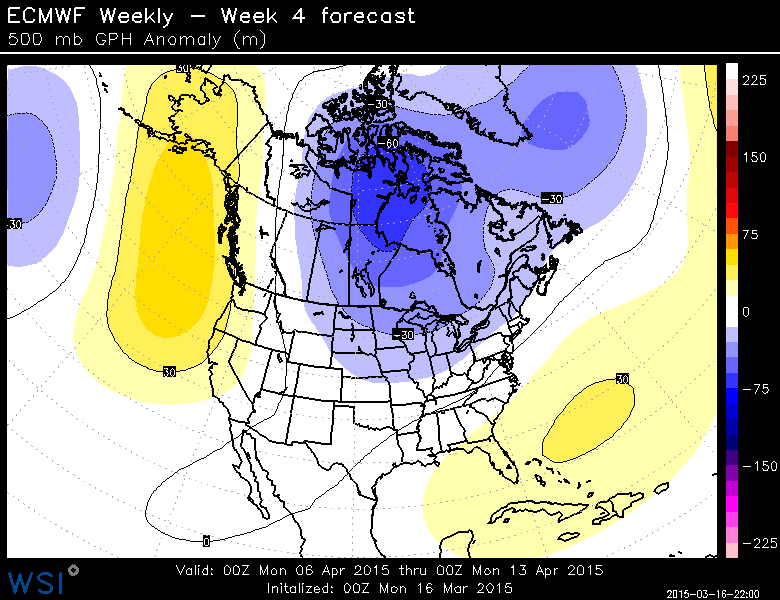 Hard to tell if it’s a transient pattern for just a few days or if the model is changing the big picture. Quite a decent windstorm, especially considering the surface low pressure center isn’t very deep. Definitely the windiest March day we’ve seen in at least 16 years. 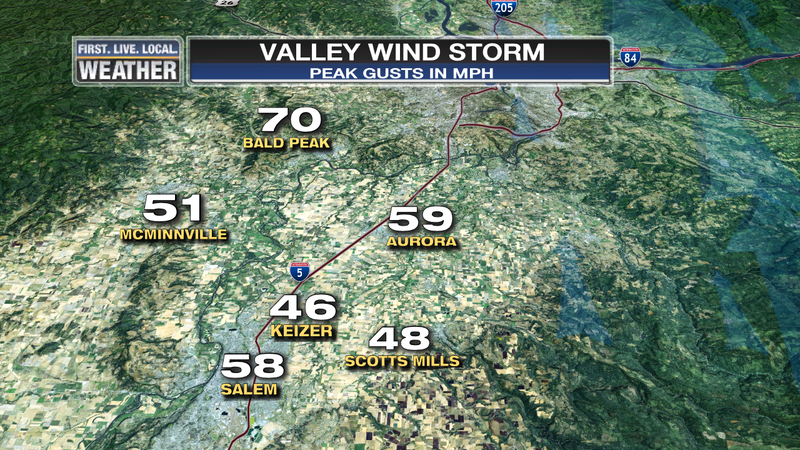 Salem and Aurora have seen winds decrease slightly from their peak in the previous post. Power going in/out here at home so I’ll be brief. 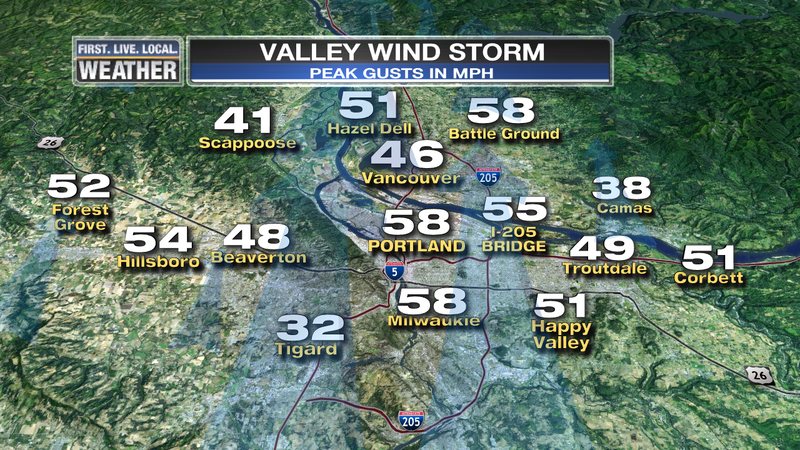 Wind has arrived a couple hours early as pressures jump to our south and the southerly wind races up the valley. Peak gust of 58 mph at Salem at 1:20pm is stronger than either of the previous storms this season. I see lots of power outages down there. About 20,000 so far in PGE’s territory. Very warm temps with the air mixing down well from above…into the 60s. That almost always happens in windstorms in our area. Wind will continue for a few more hours and then die down quite a bit around sunset or a bit before. 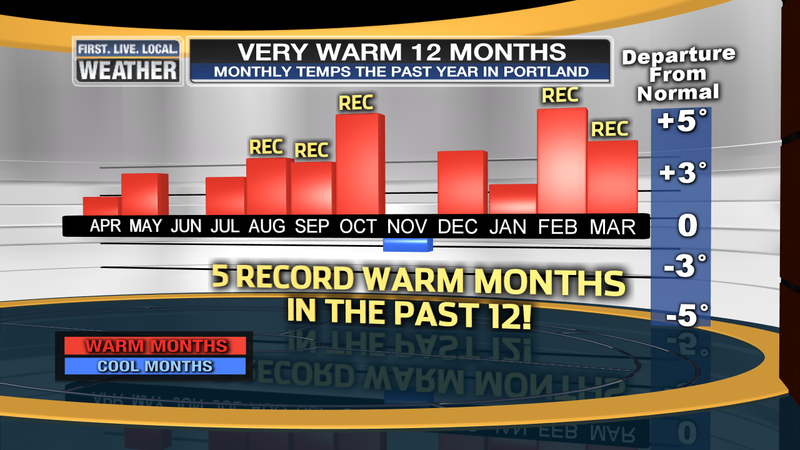 You are currently browsing the FOX 12 Weather Blog blog archives for March, 2015.